One day you’ll get there, Maruo. Baby Steps – befitting to its name till the very end. This second season really has flown by – it only felt like yesterday when Maruo was in Florida meeting new faces, learning how to be a better player. Of course, that’s what Baby Steps is all about: Maruo’s improvement, little by little, loss after loss, until he earns a rare victory, inspiring him to keep on getting better. Looking back at where this kid started off, it’s amazing to see how far he’s come. This is a story of a complete novice on his way to becoming a pro, but unlike nearly every other shonen sports anime, Baby Steps is never easy or forgiving when it comes to the outcome of its matches. It was obvious from early on in the first season that this was not a series where power-ups would suddenly appear and victory would come with every match. As much as I love Hajime no Ippo (for example), Ippo nearly always manages to win in the end, whereas here, Maruo nearly always faces defeat. Realism is what Baby Steps has going for it, and there were very few times where it entered the realm of fantasy. If anything, that came outside the court – like players being caught up in a children’s surgery drama right before a match, or the occasionally silly tennis-related backstory. Whenever it came to the games, Maruo always had to try his hardest to win, and a lot of the time he simply wasn’t good enough. 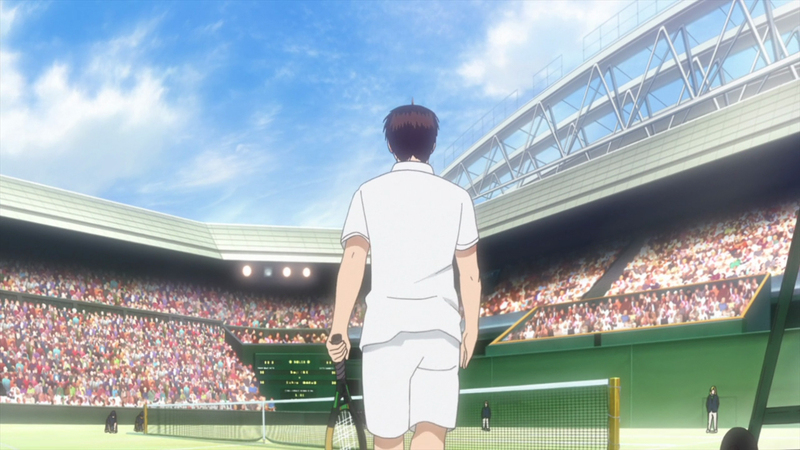 I have to give Baby Steps credit for never shying away from losing, but at the same time, midway through this second season there was a pivotal match where Maruo once again lost, which I felt was a severe let down. After victory being taken from him time and time and time again, I thought he would finally get what he deserved and be rewarded for his progression. Sadly, that wasn’t the case. It was a bold move, but one that I wasn’t happy with. He still could have won that match and the rest that followed wouldn’t be that different. To me, it felt like Maruo was being kicked while he was down, and we were made to watch as he stumbled yet again, unable to fight back. Funnily enough, when it came to Maruo’s biggest match to date in these last few episodes, I knew there was no way he would win. Not because I was disappointed and had lost all hope, but because Baby Steps had made it perfectly clear how strong his various opponent really were by comparison. When it came to him facing his toughest challenge yet, I was prepared (and even hoping) for him to lose. And that’s how it played out, because Maruo only wins when he’s good enough. It’s a constant uphill battle, and he’s still got a long way to go. But Baby Steps 2 has seen him grow into a fearsome tennis player, and it’s been an awesome journey to be a part of. The choreography, art, and animation may not have been the most inspiring whenever they were on the court – though there was an overall improvement from the first season – but when it came to the story outside of the matches, I felt the most vital scenes were blessed with the focus and detail they deserved. The most memorable scene of Baby Steps 2 has to be Maruo and Natsu on the beach, confessing to one another and then officially becoming boyfriend and girlfriend. It was one of the most realistic depictions of romance I’ve seen in a teen-centric anime/manga. It was so quick, yet perfectly pace. There seemed to be some obstacles along the way, but in the end both of them had feelings for one another, and that’s what shone through. No needless drama or waiting until the very end of the series. Having Maruo and Natsu became a couple part-way through the series should make for an interesting shift in dynamics, however, from what we seen thus far, nothing was that different – other than plenty of blushes and the gradual ease into handholding. It was sweet and endearing and I loved every scene with them together… apart from the time where he bet her in their practice match. That’s possibly the one moment of Baby Steps where I simply didn’t believe what happened. Natsu is a superior player in every sense, albeit one with a completely different approach. Seeing her lose rather easily to Maruo when he was nowhere near his strongest diminished her character, I felt. Yet after that point she went on to dominate in her matches, getting closer to becoming a pro – as she should. If there was one time I wish Maruo did suffer defeat, I wish it was against his girlfriend. She is simply a more experienced and better player than him. If Baby Steps wasn’t so Maruo-centric, perhaps we could have seen Natsu’s matches in more detail – maybe I’m biased towards her character, but I would have loved this to be a story of two highschoolers fighting for the same dream, side by side, instead of Natsu being pushed to the sidelines and only touched upon from time to time. But I suppose no matter how unique a shonen sports series this is, it must still be too out there for the female lead to have as much focus as her male counterpart, even if they plays the same sport and she is undoubtably a better player than him. It only makes sense that Baby Steps 2 ends in another defeat; Maruo simply has a lot still to learn if he wishes to be a top professional tennis player. And I believe he can be. However, It’s an unfortunate deal, because this is very likely (like 99.7%) the end of the Baby Steps anime. It’s been a wonderful ride, but it can’t compete with the other sports powerhouses that dominate the charts and heart of teenage girls. This adaptation may end here, but this is only the beginning of Maruo’s journey to become the best he can be. It’s likely to be a slow but rewarding experience – one that I have every intention of being a part of, this time by following the manga. But as for right now, Maruo’s words in the closing moments of the finale were especially poignant and almost brought a tear to my eye, and made for a perfect farewell. Among all these incredible people, I wonder how far I can go. I’ll take one step at a time. I’ll go even further, by believing in myself. Natsu may be a dominant tennis player against other girls but that doesn’t mean much compared to the competitive level of boys. Take Serena Williams for example. Dominates the rankings and tournaments like no one else. She once proclaimed she could beat any man ranked outside the top 200. During the 1998 Australian Open, sisters Serena and Venus Williams boasted that they could beat any man ranked outside the world’s top 200. The challenge was accepted by Karsten Braasch, a German player ranked No 203 (his highest ranking was No 38). Before the matches, Braasch played a round of golf in the morning, drank a couple of beers, smoked a few cigarettes, and then played the Williams sisters for a set each, one after the other. He defeated Serena, 6-1, and Venus, 6-2. Serena said afterwards “I didn’t know it would be that hard. I hit shots that would have been winners on the women’s tour and he got to them easily.” Braasch said afterwards, “500 and above, no chance.” He added that he had played like someone ranked 600th in order to keep the game “fun.” Braasch said the big difference was that men can chase down shots much easier, and that men put spin on the ball that the women can’t handle. The Williams sisters adjusted their claim to beating men outside the top 350. So, knowing tennis, I can say with full confidence that Maruo trashing Natsu is completely believable. She doesn’t have the physique to compete with him. Maruo would be considered average on the national level in terms of fitness but that still surpasses anything the top girls could reach. It it what it is. Anyway, it was a very enjoyable season. I hope we eventually get a 3rd one where they show his first national tournament. The scanlations are currently there but they’re slow so it would be nice to see the anime continue and go past what’s scanlated. Yeah I don’t think there’s any doubt that Natsu was the more skilled player during that match, but Baby Steps prides itself on realism and at that point Maruo’s much greater physical strength was enough to overcome the skill gap. I wonder how much of a tennis player the author is. Who knows, maybe even personal experience had something to do with how she wrote that particular match. You left the fact out that Serena and Venus were 16 and 17 at the time. And both ranked in the top 5 in the world. Yeah, you can say you wanted him to lose and all that for it to be a more real experience but for them to end both seasons on a loss, I don’t know, you’d think they would adjust the pacing to end on a win. And the fact that they didn’t say a new season was coming like last year AND ended on a loss… It just leaves me let down. Not really my favorite feeling when finishing an anime. Realistic or not. Whilst I can fully understand and appreciate why many viewers may feel frustrated that Maruo loses many of his pivotal matches, I’m personally fine with it. It’s reiterated time and time again that he has improved incredibly in such a short space of time. This is a remarkable feat in itself that he can go from someone who was never particularly sporty (quite the opposite) to someone who can challenge the best players in his country in a mere few years. We need to bear in mind that all of these players have been at it since they were extremely young. In this regard, it’s very much like your standard shounen where the protagonist has some hidden talent that accelerates his growth from zero to hero. Lastly, it’s not as if he loses every match, just the main ones. He breezes past quite a few players with relative ease in the tournaments he’s in, but these matches are obviously brushed aside/not focused. Started with the first few episodes in season 1, then stopped (because, time). Given that they portray Maruo’s development in a more realistic light by making him good (but not as good as established powerhouse characters), I need to pick up where I left off. I wish they showed a full match of Natsu versus whoever and see her thought patterns the way we do for Maruo when it comes to tennis. All we ever get to see is either the start or the end of her matches. I know the show is about Maruo but eh. I think the pacing of Maruo’s losing streak was the best part of the show. It was addressed when he was becoming accustomed to losing. Breaking that cycle was a turning point for him in Florida. Him winning against Natsu was not the point. Winning and losing is never the point with Baby Steps, it is the lessons being learned and overcoming them which is the focus of the show. Maruo learned to vary his attacks outside the realm of logic which help him progress to the next level. It was the best show on, can’t wait for season three. Yeah, Baby Steps is one of the better sports themed anime I have seen thus far. The main strength of the show lies at its realism. This is not a show with the characteristic shonen formula of overcoming the odds and winning at the end. Losing and learning the lessons that come along with it, and striving to improve is arguably even more important than winning. This show is really inspiring for everybody in all walks of life. While we may not all be sportsman, encountering adversities is part and parcel of life, and it is precisely because Baby Steps is not overly shonen, that ordinary people can relate to it and feel strongly about it. You cannot help but develop and attachment to all the characters in the series. They all have their own battles, dreams and demons. I also felt that the romance was handled really well, without clouding out the focus, which is the tennis. This was a really fun and excellent anime. Too bad it doesn’t seem like a season 3 is in the cards, but I’m glad it got this much. I just love how it tried hard to be both realistic and enjoyable. Maruo made massive progress to this point, but it was believable since you saw every step and the insane work he put in. Easily my favorite sports anime period. Plus I really liked how it handled things with Maruo and Natsu. It didn’t rush it, but it didn’t ignore it either. They had small progress, bit by bit. It didn’t just sit on them having feelings for each other until the last minute, but just moved things forward when they made sense. A relationship isn’t the end, but one step. I’ll miss the anime, but keep on following the manga. Hopefully this anime did it’s job in getting a lot of people interested in this story. Most inspirational sports series since Ippo. Maruo was such an inspirational lead. And I loved his relationship with Nat-chan. Hell, it’s amazing that those two were even in a relationship in the first place. That’s a rare treat nowadays. With the recent announcement of a 2nd season for Kyoukai no Rinne(also on NHK), I was hoping there’d be a 3rd season announcement for Baby Steps, but I guess we can’t be that lucky. Great show overall. I’ll miss it.